Originally my intent behind doing this was to re-evaluate myself. Apply some introspection and practice what I preached by being self-critical and coming to terms with the fact that, besides my best intentions, my quiver had sprawled like modern day suburbia. It was time to reign it in. What happened next kind of surprised me. After looking at all my boards sprawled out in the grass, I realized something, something we try and re-iterate time and time again here on Phoresia but I hadn’t really come to terms with the practical implications of it until today. Durability. The reason my quiver had outgrown it’s intended storage space was due in part to durability. By getting my boards glassed a little stronger and by using some alternative construction my boards were lasting much longer. So instead of replacing a board that was worn out I was ordering new ones with different variations, or in the case of the Bonzer, something totally new to me. Durability had allowed me to experiment and try new things versus just replacing what had worn out prematurely. The picture above is kind of deceiving because there are actually 2 sets of boards there that are somewhat redundant. There are two 6’4″s, one 6/6/6 poly and the other a stringerless EPS/epoxy. There are two of the exact same 6’0″ rocketfishes, one in Biofoam that’s a quad and one that’s EPS/epoxy that’s a thruster. The EPS/epoxy board is nearly 3 years old and has been abused to hell and is still holding up great. That durability allowed me to order another similar board but in different material and a different fin setup to be able to compare apples to apples somewhat. In my experience, this has been the best way to test out new materials. Have a baseline setup to compare to then change a few variables at a time, in this case blank material and fin setup. Again the durability of these boards will allow me to recycle them back into the local shop as trade-ins or post them on a site like ReRip.com. The durability aspect really has quite a few added benefits for the average surfboard. Not only are you getting more useful life from the board, you are less likely to snap or ding the board and also it keeps the materials out of the trash and in the water for a longer time. This allows you to get new boards instead of just buying boards to replace worn out ones, or to sell your used board that still has useful life in it. So after much deliberation, none of the kids are getting kicked to the curb just yet. The single fin is actually the board Ricardo was riding the first time we met while we were both out surfing. I was digging on the board and asked him to ride it. It was given to me on permanent loan a few years back so needless to say, it’s always got a place in the racks. The mini-gun gets used maybe a handful of times each year, but those days it’s a necessity and I’ve had that board for almost 10 years now and have the utmost confidence in it. Key in a big-wave board. Rack space #2 filled. The 5′ 10″ quad is my summer board and has paid it’s dues as well. I’m hoping to re-create it as a hollow wooden board this summer if time permits. I’ve already got it made up in AKU shaper, just need to print the ribs and stringer. The 6’0″ rocketfishes are kind of redundant and could be paired down to one board, but the new job I start next week has flex-time and is only 1.5 miles from the beach, so I may keep one at the office so if I ride my bike to work I’ve always got a board there. The 6’2″ Bonzer may just be my new favorite board, but I haven’t had enough sessions on it to really feel it out. It could take the place of my 6’4″ as my good wave board. I can probably get rid of the yellow 6’4″ now, it’s served it’s purpose well with sessions in Costa, Hawaii, and Australia. It’s got that late 90’s entry rocker though and I wanted something with more early entry ability and am pretty stoked on the new 6’4″ stringerless board. So really, after deliberating about the quiver, there’s only one board that can go, the old 6’4″. I may just keep it though and put straps on it for kiteboarding, who knows. Better to retro-fit it than get a new board. All in all I’m pretty stoked on the quiver at this point and have been happy with the durability of the various boards and the myriad of different construction techniques. I feel like I’ve got all my boards dialed in to where it’s my own abilities that are holding me back and not the boards. The best part is most of them are a few years old and will easily give me a few more years of quality shred-sledding. Moral of the story? It’s good to pull out the complete quiver now and again and give it a good critical evaluation. In thinking of new boards to fill the voids, also think of what materials you could use to make those boards last longer while still serving their intended purpose. Poly has it’s place as well as epoxy and wood. They can all be made to be extremely durable, it’s just up to us at the consumer to require them to be built that way. In the end you’ll be glad you did. Great post. Couldn’t agree more. Quality and durability have as much to do with “sustainability” as do so-called alternative materials. 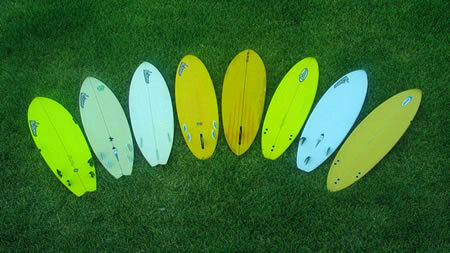 Quiver introspection is a common theme with me. My quiver is somewhat varied (fishes, eggs, thrusters, quads and logs). I simply love feeling different wave conditions on different boards. I’ve use the “x number of rack spots” as the forcing function… thus if I want a new board I need to part with one. That’s worked pretty well. Nice post.